Mr. Richard Warrener was born at Cayton, in the Scarborough Branch of the Hull Circuit, on December 24th, 1819. His parents were both devoted members of our church, entertained the preachers, and were a good help to the society. Richard left home in early life and earned his own living in the capacity of a farm servant. He was converted to God in October, 1819, at North Burton, now in the Bridlington Circuit, and subsequently removed to Kilham, in the Driffield Station where he united with our Society as a member. He steadily pursued his course, regularly attending the means of grace, pressed into the experience of a full salvation, and made great progress in the Divine life. Showing promise of usefulness in the cause, the Rev. W. Harland entered his name on the plan as a local preacher, and for years he travelled long distances to publish the good news of the kingdom, and had the joy of seeing much good accomplished. He resided in Christhorpe for twelve years, and largely through his influence and labours a chapel was erected in which he commenced a Sunday school as soon as it was opened. In 1865 he removed into Filey, where he heartily engaged in the work of the Church, and liberally assisted in the erection of the present beautiful chapel. 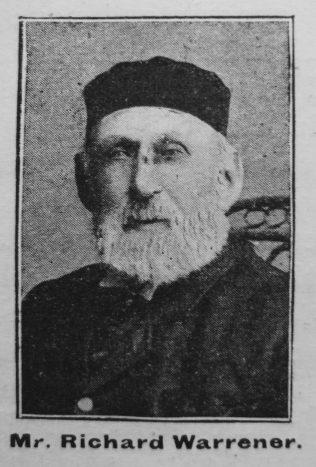 After twenty years, residence in Filey, Mr. Warrener removed to Scarborough, and united with the Gladstone Road Church, where he used his influence for the good of the cause, and contributed liberally to its support. At the Conference of 1899 he was elected a member of the Deed Poll. This was an honour which he greatly prized. Mr. Warrener lived over 83 years. He attended his class for the last time on Monday evening, August 17th, and in narrating his experience he referred to his failing strength, and his approaching end. He was full of confidence and holy rapture. On the following Friday he was seized with a paralytic stroke, and became speechless. He rallied a little, however, the next day, and hopes were entertained of his recovery. But he gradually became weaker. He was not able to speak much, but he gave repeated assurances that the Lord was with him as his All-sufficient Saviour. He repeated the following verse with great confidence and joy:- “Jesus thy blood, and righteousness” etc. With rapturous emotion he said:- “What joy there is in these words!” Nature was exhausted, and he sank into a profound slumber, and on Tuesday morning, September 1st, he peacefully departed to be with Christ whom he had so ardently loved, and loyally served. On Friday, September 4th, devout men carried him to his grave in the New Cemetery, Scarborough. The General Committee kindly sent the Rev. W.E. Crombie as its representative. The service was conducted by Rev. W. Wright, assisted by Revs. H. Carden, S. Bates, F. Ash, and W.E. Crombie. A special Memorial Service was held in Gladstone Road Church on Sunday evening, September 6th, when an appropriate sermon was preached to a deeply interested congregation. Richard was baptised on 9 January 1820 at Cayton, Yorkshire. His parents were William, a farm labourer, and Ann. Richard married Margaret Bielby, nee Cowton (abt 1807-1879) on 13 August 1842 at Scarborough, Yorkshire. Census returns identify one child. Richard married Mary Ann Midgley, a widow, (abt1839-1910) in the summer of 1891 at Scarborough, Yorkshire. Richard died on 1 September 1903 at Scarborough, Yorkshire. Note: The date of his conversion given in the obituary must be a typographical error.